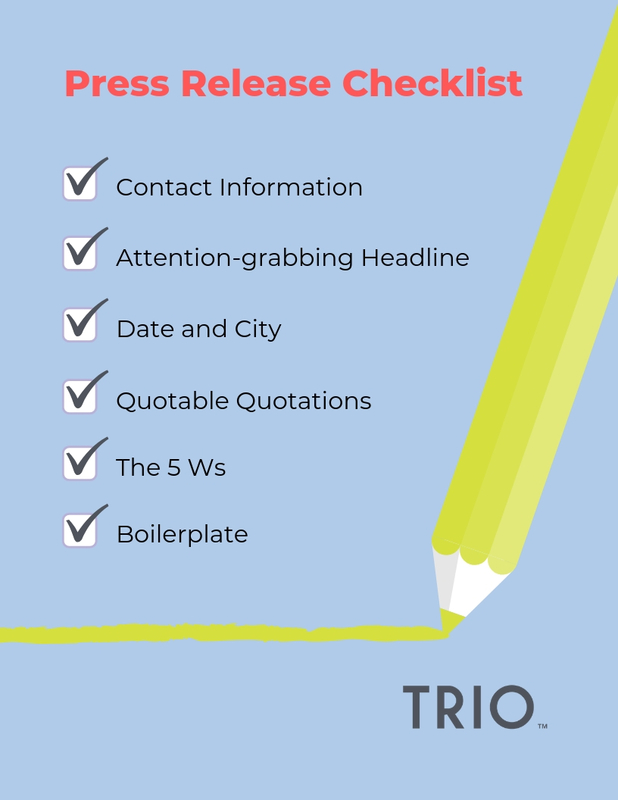 How to Write the Perfect Press Release | Trio Solutions Inc. The whole point of a press release is to grab the attention of the reader. You’ve got something important to share; otherwise, you wouldn’t be putting out a press release. That’s why it’s imperative to immediately begin your document with the most wow-worthy information. If your business is rolling out a new product, for instance, start with the most exciting thing about it. Then, you can go into more details once you’ve got them hooked. Another thing to remember? Press releases are purely factual, meaning they’re not the place to share your opinions. Take it back to Schoolhouse Rock with writing basics. Your reader needs to know who, what, when, where and why this news matters to them. Keep the readers’ needs in mind as you thoughtfully lay out the information that needs to be shared. Pepper in interesting details that differentiate your product or news story and that make it a necessary blip in the news cycle. At TRIO, we try to include at least one or two quotes per press release. These quotes should be shareable in a way that ties back to your news and that sparks emotion from the reader. If you include a quote from the president, for instance, perhaps they could speak to the hard work that made this idea successful, or the defining moment that changed the trajectory of the project. Make it emotional, make it inspirational, make it worth remembering. Master the basics to avoid unnecessary confusion. Make sure that your press release is easily readable by adhering to basic formatting standards. At the bottom, there should be a boilerplate with information about your company (read our tips for crafting an awesome boilerplate here). At the top, there should be contact information and a headline that sums up what the press release is about, and you should also display your company logo. You should also include the date and city at the top of the opening paragraph and strictly follow AP style in every instance. At the end of your copy, be sure to provide links to your website and social media handles, and if you’re planning an event, a link where the reader can purchase tickets. The goal of a press release is to make it as easy as possible for the reader to access the information you want. When you make sure it’s all covered, you’re doing both them and yourself a favor. Pro tip: Adding hi-res images takes your press release to the next level. This doesn’t mean embedding them within the press release; rather, sending a link will suffice. Adding a link with quality, high-resolution images increases the chances of your news being picked up! If you have more questions about how to make your press release perfect, shoot us an email or give us a call. We’d love to help your business get the word out!